When spinach starts growing it's one of the easiest vegetables but many gardeners have problems with seed germination, either they don't appear to grow at all or very erratically. We give you all the background information necessary for growing spinach from seed in the UK and Ireland. It's ideally suited to our cool and wet climates so may well succeed in years when other vegetables fail. Another distinct advantage is that spinach can be sown in both spring and autumn giving you a crop for five months or more. Before reading this article further why not take two minutes to adjust all the dates in this website (including those below) to be more accurate for your home town (both UK and Ireland). The dates will default to the UK average if no dates are set. The settings will last for six months. Spinach seed is more sensitive to ground temperatures compared to many other vegetables so the date for sowing seed outside is key to success. When sowing seeds indoors you are able to control the temperature more accurately. Spinach doesn't like the heat in summer so if you want it to crop for as long as possible in summer choose a plot of land which is protected from the midday sun. 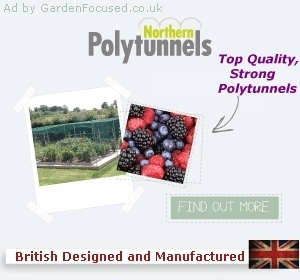 If you grow sweet corn or other tall crops these can provide good shade when it's needed most. They definitely prefer a soil which retains moisture well so sandy soils especially will need to be well prepared for spinach. Spinach are one those vegetables which can be planted in ground whatever the previous vegetable because they suffer from very few soil borne pests and diseases. 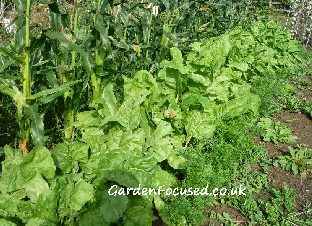 However for crop rotation purposes they are normally sown with brassicas such as cabbage, Brussels Sprouts, broccoli, cauliflower etc. For those statistically inclined, spinach seeds germinate best at a soil temperature of 60°F / 15°C but do fine within the range 50°F / 10°C to 72°F / 22°C. At lower temperatures they may well germinate but take longer to do so, at higher temperatures the seeds may well fail to germinate at all. The fresher your spinach seeds the better chance you have with them. Although they are said to keep for two years we would recommend buying new seeds each year. Commercially, almost no spinach is grown in the UK, the vast proportion of spinach grown in the world comes from China with the USA coming a very, very poor second. According to the Environmental Working Group in 2014, spinach was the sixth worse vegetable / fruit for pesticide residues. Don't investigate any further because if you do you may never eat shop bought spinach again, the contamination levels are very high. An excellent reason to grow your own! Prepare the soil by digging it to 30cm / 1ft at least, spinach has deep roots and compacted soil is not good for them. Dig the soil to a fine tilth rather than just breaking it up, this is especially important if you plan to sow seeds directly in the ground because they are small. They also need lots of nitrogen so add a couple of handfuls of blood, fish and bone per square metre / yard when you are digging the ground. For an early summer crop there are two methods for sowing spinach seed. The easiest is to start sowing directly in the ground in the third week of March. A second sowing can be made a couple of weeks of later to ensure good continuity of cropping. First, rake the soil surface so that it is level and fine. Next make a shallow line in the soil about 1cm deep, if the soil is dry water gently and allow the water to drain away. 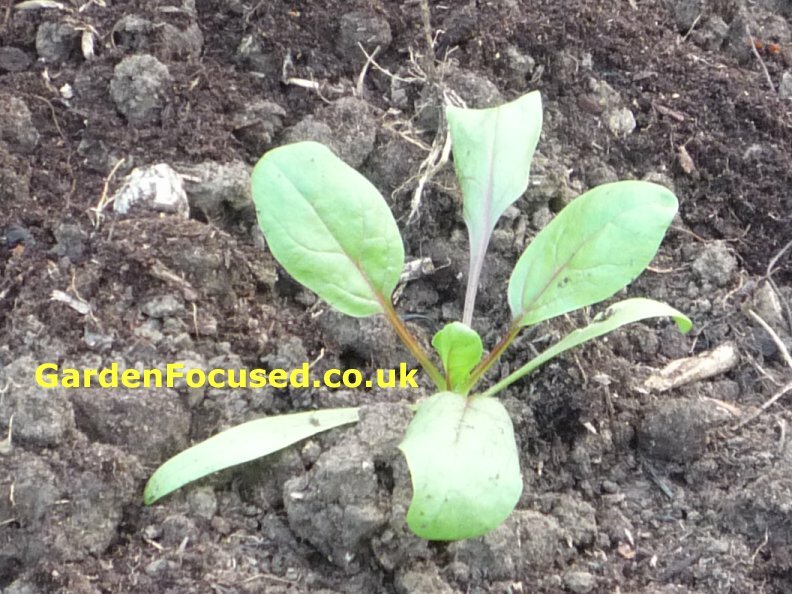 Fully grown spinach have a spread of about 30cm / 1ft so the seeds should be sown thinly, about 2cm (just under an inch) apart. If you sow more than one row keep them 30cm / 1ft apart which will be enough room for them to grow and at the same time they will support each other when fully developed. Lightly cover the seeds and mark the row(s) with the date of sowing and the variety. In the first week of April fill up a jar with tap water and leave it for a few hours to let the chlorine evaporate. Add the seeds to the water at room temperature for one day. During this time they will absorb some of the water and begin the germination process. 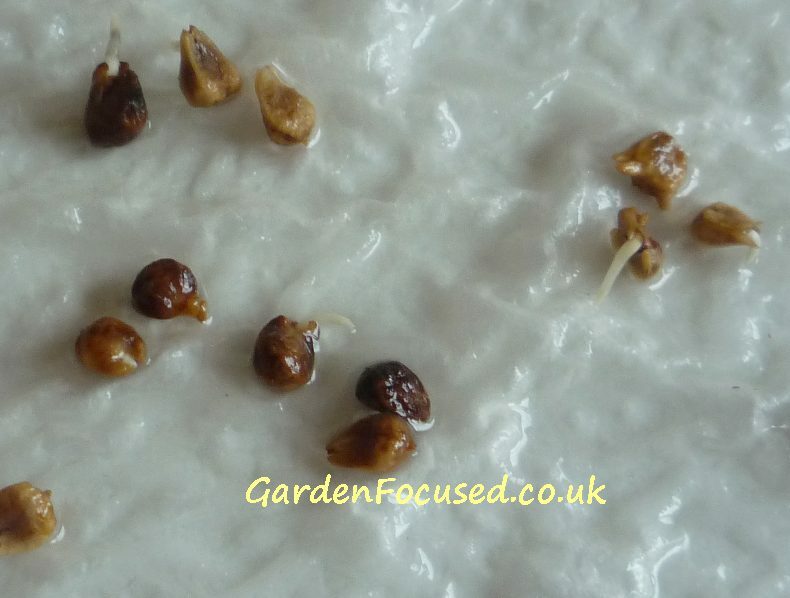 Keep a good watch on the seeds after the first day and look for signs that they have germinated - you will see a tiny sprout emerge from the seed. As soon as the seed have germinated go onto the next stage as soon as possible. If the seeds are left too long on the kitchen paper they can take root in it making it difficult to remove them. You now have two choices, either sow the germinated seeds directly in the ground as described previously or they can be sown in pots of multi-purpose compost for transplanting outside in a couple of weeks time. Personally, we prefer to sow them in pots. The often given advice that spinach doesn't transplant well seems to have come out of thin air and been endlessly repeated without any basis in practical experience. We have found that they transplant well with no problems. Fill 8cm /3in pots with multi-purpose compost and water well. Make a 1cm hole in the compost, drop in one of the pre-germinated seeds and lightly cover with compost. Place the pots in a cool but light position which is frost free - against a house wall normally does well and water if the pots begin to dry out. The plants are ready to be transplanted into their final positions when they are about 5cm / 2in tall. Plant one every 15cm /6in and water well to help them establish quickly. Don't leave the plants in the pots for too long unless you use deep pots. The roots need room to expand very quickly and small pots are not ideal for this. Sowing spinach in autumn results in a quick crop which extends the season considerably. The best time to sow seed for an autumn crop is in the second week of September. Seeds can be sown in pots or directly in the ground exactly as described for spring sowings above. You can expect to start harvesting young leaves about six weeks later. If you have a cloche then protecting the crop in November time will extend the harvesting period by two to three weeks. The absolute first problem you will probably encounter with growing spinach is slugs and snails. Although they cause minimal damage when the crop is established they can easily wipe out whole rows of recently germinated seedlings. They can do this so quickly that you may not realise what the problem is. See our pest and disease section at the end of this article for suggestions on doing battle with slugs and snails to protect your seedlings. If you have sown seed directly in the ground then they will need to be thinned out. Do this when the plants start to touch each other and you can use the thinnings in the kitchen. The final thinning out should leave 30cm / 1ft between each plant. Water is the next consideration if you want a decent crop of spinach. Water-logging them won't do much good but they do need copious amounts of water in dry weather. If left without sufficient water they bolt and start to produce seed making the leaves taste very bitter. You may as well compost any plants which start to produce seed. Weeding will be needed especially when the plants are small. However, as soon as the plants establish, they grow so quickly that they smother most weeds. Harvest the outer leaves of spinach first working your way inwards. Because the plants grow rapidly when established we always harvest them when young because they grow back almost in front of your eyes! Certainly faster than the average family can eat them. There are many varieties of spinach seed for sale in the UK, we pick six of the best and review them in detail. Click here to go to that review now. Rarely a problem after the plants have established themselves because they are quite capable of outgrowing any damage done. But at the seedling stage slugs and snails can easily ruin your crop. 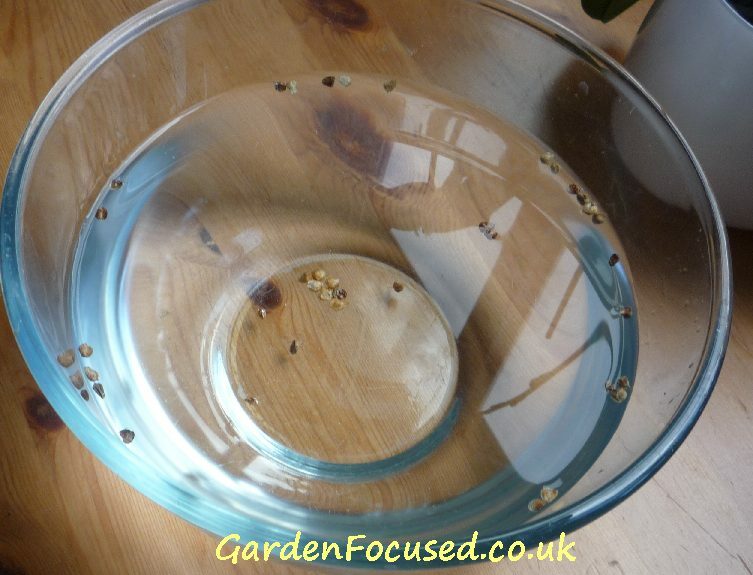 If you have problems with either of these pests we strongly suggest that you pre-germinate your seeds and bring them on initially in pots as explained earlier in this article. Thin out the plants to allow better air-circulation and pick off affected leaves. If this is a problem in your garden then choose mildew-resistant varieties in future such as Amazon, Barbados and Palco. These can also be a problem in some gardens with birds pecking out young seedlings. The only solution is to put netting over the plants until they are established. To cook spinach as side vegetable either steam / lightly boil or saute in olive oil. Cut the spinach up roughly and steam or lightly boil for three minutes. To saute stir fry in minimal oil for one and a half minutes. If you plan to use spinach as part of a recipe it is normally steamed for three minutes then dunked in ice cold water to retain the colour. It can be added to risottos and frittatas for extra flavour and colour. One particular favourite use of ours is to add some to a Spanish omelette. Follow the recipe exactly as per the link but add 200g of spinach at the end of step 1 cooking for a further two minutes. Another excellent one which uses up a variety of vegetables you may have is feta cheese and spinach pie with tomato relish. If you have your own tomatoes just substitute them for the canned ones in the ingredients. One all the way from down under Australia is herb and spinach penne. This one is simple to make and foolproof. Almost all pasta dishes can benefit from a portion of spinach added to them. They also have an excellent interpretation of the traditional Greek favourite spinach, feta and filo pie. To round it off try this spicy beans and wilted spinach recipe. If you have any questions or comments about growing spinach, pests and diseases or anything else leave them using the form below. Our experts will answer them as soon as possible. QUESTION: Are some of the dates the wrong way around, sow indoors AFTER outdoor dates? ANSWER: The dates on the website are correct even though they appear counter-intuitive. First, the reason for starting spinach off in pots indoors is to avoid any problem you may have with germination, some people do, some people don't. It is not to get an earlier crop. 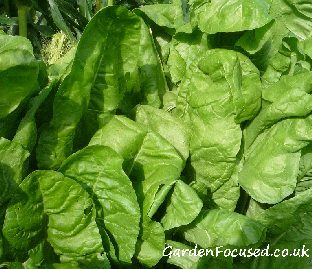 Second, spinach is not fully frost hardy in general, but seed sown outside will produce plants which are more cold hardy compared to sowings made in pots indoors. Those spinach plants sown indoors need to be protected from frost to a greater degree than outdoor sown plants. So, the logic is that you need to sow indoors slightly later compared to outdoor sowings to avoid any problems with cold when you plant out the indoor sown plants. ANSWER: So high temperatures are not a problem! It’s very difficult to diagnose but my guess includes one other factor, rainfall. Cambridge is one of the driest parts of the UK and lack of water will put a spinach plant (and others) under stress. Stress to a plant is a signal that it needs to make seeds because lack of water may soon kill it. My advice therefore would be to ensure the soil is moist but not waterlogged. Hand watering will be required.